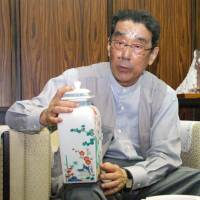 Eminent potter Kakiemon Sakaida, who maintained the tradition of Kakiemon-style porcelain, died Saturday of cancer at a hospital in Saga. He was 78. The Sakaida family started producing Kakiemon porcelain in the 17th century. It was then exported to Europe and greatly affected the subsequent development of the continent’s porcelain industry. The heirs of the Sakaida family have all assumed the same first name after the death of their father. Kakiemon Sakaida did so in 1982, becoming the 14th to assume the title. In 2001, the government designated him a living national treasure. Sakaida, who was trained by his father, further developed the Kakiemon kiln in Arita, Saga Prefecture. He had a son, Hiroshi, 45, who works at the kiln. The son is expected to soon become the 15th Kakiemon Sakaida and take charge of the facility. Kakiemon porcelain is still well-known today both home and abroad for its pure white surface background and bright red paint used for glazed decoration.